Triplet imaging is a novel optical technique that allows investigating oxygen metabolism at the single cell and the sub-cellular level. The method combines high temporal and spatial resolutions which are required for the monitoring of fast kinetics of oxygen concentration in living cells. Calibration and validation are demonstrated with a titration experiment using l-ascorbic acid with the enzyme ascorbase oxidase. The method was applied to a biological cell system, employing as reporter a cytosolic fusion protein of β-galactosidase with a SNAP-tag labeled with tetramethylrhodamine. Oxygen consumption in single smooth muscle cells A7r5 during an [Arg8]-vasopressin-induced contraction is measured. 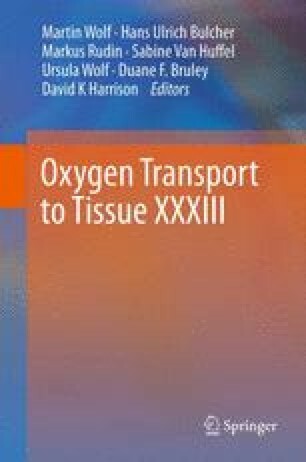 The triplet lifetime images over time can be related to an intracellular oxygen consumption corresponding to a mono-exponentially decaying intracellular oxygen concentration. This is in good agreement with previously reported measurements of oxygen consumption in skeletal muscle fibers.